Carson DV-30 DualView Is A 3x Power Stand Loupe With A 12x Power Focusing Loupe. This Dual Purpose Magnifier Is Great Whether You Need A High-Powered Or A Lower Powered Magnifier. Carson FH-25 FreeHand Magnifier With LED Light Can Be Used As A Hand Held Magnifier Or Folded For Convenient Hands Free Use. 2.5x Power Lens With Built-In 5x Spot Lens. Carson LL-20 LumiLoupe Is A Stand Magnifier With Pre-Focused Dual Lenses. This Magnifier Is Ideal For Close-Up Examination Of Objects. 10x Magnification. Carson OD-55 MagniGrip Magnifier Is A Compact Magnifier With Attached Fine-Point Tweezer. 4.5x Magnification. Carson OD-99 Fish'nGrip Is A Magnifier Combined With A 3-in-1 Fishing Tool-Tweezers, Line Clippers And Hook-Eye Cleaner. 4.5x Magnification. Coil 4206 Fixed Stand Magnifier with Bi-Aspheric 6X Magnification Lens. The Bi-Aspheric Lens gives a sharp distortion-free image. The Acrylic Lens material offers excellent clarity and strength. Bi-Aspheric Lens for a sharp distortion-free image. Coil 4208 Fixed Stand Magnifier with Bi-Aspheric 8X Magnification Lens. The Bi-Aspheric Lens gives a sharp distortion-free image. The Acrylic Lens material offers excellent clarity and strength. Bi-Aspheric Lens for a sharp distortion-free image. Coil 4210 Fixed Stand Magnifier with Bi-Aspheric 10X Magnification Lens. The Bi-Aspheric Lens gives a sharp distortion-free image. The Acrylic Lens material offers excellent clarity and strength. Bi-Aspheric Lens for a sharp distortion-free image. Coil 4212 Fixed Stand Magnifier with Bi-Aspheric 12X Magnification Lens. The Bi-Aspheric Lens gives a sharp distortion-free image. The Acrylic Lens material offers excellent clarity and strength. Bi-Aspheric Lens for a sharp distortion-free image. Coil 4215 Adjustable Focus Stand Magnifier with Bi-Aspheric 15X Magnification Lens. The Bi-Aspheric Lens gives a sharp distortion-free image. The Acrylic Lens material offers excellent clarity and strength. Includes Protective Pouch. Coil 4220 Adjustable Focus Stand Magnifier with Bi-Aspheric 20X Magnification Lens. The Bi-Aspheric Lens gives a sharp distortion-free image. The Acrylic Lens material offers excellent clarity and strength. Includes Protective Pouch. Coil 5123 L.V.A. Aspheric Stand Reader with 7X Magnification, Aspheric Lens for a sharp distortion-free image. The Frame is lightweight and comfortable to hold. The Viewing Distance is pre-set for the optimum image quality. 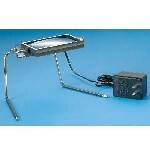 Coil 5214 Tilt Stand Magnifier with Bi-Aspheric 4X Magnification Lens. The Bi-Aspheric Lens gives a sharp distortion-free image. The Acrylic Lens material offers excellent clarity and strength. Bi-Aspheric Lens for a sharp image at any angle. Coil 5428 Cataract Stand Reader with 5.4X Magnification, Aspheric Lens for a sharp distortion-free image. The Frame is lightweight and comfortable to hold. The Viewing Distance is pre-set for the optimum image quality. Coil 5472 Large Aspheric Stand Reader with 2.8X Magnification, Aspheric Lens for a sharp distortion-free image. The Frame is lightweight and comfortable to hold. The Viewing Distance is pre-set for the optimum image quality. Coil 5474 Small Aspheric Stand Reader with 3.5X Magnification, Aspheric Lens for a sharp distortion-free image. The Frame is lightweight and comfortable to hold. The Viewing Distance is pre-set for the optimum image quality. Eschenbach 1438-8 Menas Zoom Adjustable Magnifier By simply twisting the top of the MenasZoom, the magnification will increase from 2.2x up to 3.4x allowing users to select the magnification that is best for them to view images or text. Eschenbach 1511-001 Mobase Magnifier Stand for 3x, 3.5x, 4x. With the Mobase stand, MobiluxÂ® LED hand-held magnifiers can now be used as stand magnifier. Eschenbach 1511-004 Mobase Magnifier Stand for 10x, 12x. With the Mobase stand, MobiluxÂ® LED hand-held magnifiers can now be used as stand magnifier. Eschenbach 1565-12 Scribolux Stand Magnifier Features Bright SMD LED Illumination As Is Perfect For Doing Crossword Puzzles. 2.8X Magnification.